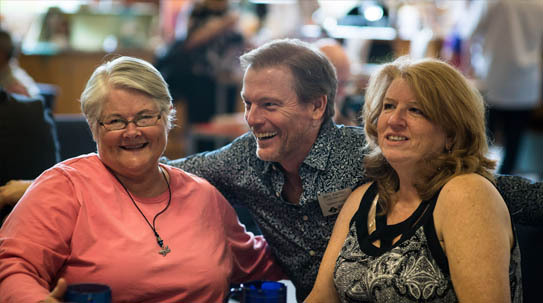 As a deeply spiritual community, the Center for Spiritual Living is a place to find support in times of joy, celebrations and triumphs, as well as through times of loss, sorrows, and pain. Whatever your situation or season of life, you’ll find support in the form of one of our many drop-in community groups. Loss is part of the human condition. If you are experiencing loss, the Compassion Through Loss support group offers a way to heal through loving support and prayer. Through the teachings of Science of Mind, this group explores many paths to recovery. Join us in prayer every Sunday regardless of your location! Our wonderful Prayer Practitioners are bringing a new way to provide prayer support to our community — Every Sunday from 12:15-12:45pm, Practitioners will be available online using Zoom to provide Virtual Prayer Circles to online and virtual participants of our CSL spiritual community. Simply click the link listed below at 12:15pm on Sundays to join a Virtual Prayer Circle led by a CSL Prayer Practitioner. Begin each Sunday with a guided meditation to get centered and focused on the Spirit within. Each month, we take a spiritual principle and explore it from the masculine perspective. It’s a practical, fun and sometimes challenging look at how we can put these spiritual truths into action in our daily lives. As men, we want to make real difference in our world. Through this Circle, we do. Bring a friend and experience the power of being supported as a spiritual man in the real world! The program, built and designed by Young Adult leaders, is dedicated to forming community through discussion and self-exploration. Adults, ages 18-35, and adults older than 35 who identify as Young Adults are welcome to participate through workshops and group discussion led by guest facilitators. Facilitators are qualified professionals with expertise in empowering people through personal growth. Stay connected with our Next Thought Community. This popular group offers women a way to find support and make connections with other women. Through the Women’s Circle, you can also experience being heard, sharing your passions with others, give and receive spiritual support, and explore and express your individual Good—all while having fun! Ready to meet other women and share the journey of Joy and Expansion? This is the group for you. 1st Tue, 9:45am-12pm. Contact CSL Office for Location. Looking for a way to age gracefully, energetically, and spiritually? Then SAGES is for you. We are an affinity group of retired people who are at least 55 years old or better, and who have found a way to share the process of “aging” in a way that is mutually supportive, comradely, and enlightening. What are you waiting for? Come join our Seniors who are aging gratefully, energetically and spiritually at CSL. We are always looking for new SAGES! Mindfulness and meditation practice is proven to benefit our physical, emotional and mental wellbeing. Some of the most common benefits of mindfulness include decreased stress, improved focus and clarity, enhanced ability to deal with illness, facilitation of recovery, decreased depressive symptoms, and improved general health. You are invited to take a free Mid-Week Mindfulness Break with us every Wednesday and experience the power of this simple practice in your life! On hiatus; check back for details. If you define yourself as an “animal person,” then this group may be tailor-made for you. The educational program takes place from 7– 8pm, followed by conversation with other like-minded animal people until 8:30pm. Educational Program, $10 Love Offering.